What do you do when someone shuts you down right from the get-go? There’s plenty of good advice out there on how to overcome sales objections, but most of it is about what to do during a negotiation. Knowing how to respond to rejection can be tough. So we thought we’d take a crack at it. See when the objection responses you send are being opened. One way to change someone’s mind is to show them a perspective they may not have previously considered. The key is to build your response around information your prospect has already acknowledged is true. That makes it harder to argue with you without being contradictory. It’s kind of like scrolling through Instagram filters. The underlying content of the photo stays the same, but changing the filter alters the feeling you get from the image. Real world use case: “We already work with a competitor.” Reframe their response to position your offering as either 1) complementary to the existing solution or 2) uniquely different. Check out this email exchange from Matt Bertuzzi of the Bridge Group. In less than 40 words, the rep acknowledges the incumbent competitor, and then reframes the conversation (earning major sales objection kudos in the process). It reframes the situation to create a new understanding. It distracts from what might be a difficult issue to resolve. Real world use case: “This isn’t a priority right now.” Keep the door open for further conversation and deflect attention away from the present issue by taking a higher, more general viewpoint. Here’s how one sales rep employed this technique to land a meeting with Yesware’s very own VP of Marketing, Andrew Archer. Notice how he calls out the small time commitment at the end? Hard to argue with that. Relate — Show that you understand and empathize with their objection. Bridge the gap — Offer new information that makes it easy for them to move forward. Ask again — Get their commitment. Coined by Yesware sales extraordinaire Ian Adams, this three-part formula for overcoming objections works by establishing harmony; it reassures people that you’re on their side — like a best friend. Real world use case: “Email me your information” (when you’re on a cold call). Don’t fall for the brush off. Instead, treat the person on the other end of the line like they’re your friend you can relate to, and that you genuinely want to help. Me: Can we find a 30 minute window next week to talk more? Prospect: Just send me an email. I’ll take a look at my calendar to see if it’s possible (classic sales objection/blow off). Me: Yeah, that’s not a problem (from step #1 above, nice). What’s the best email to send that to? Me: Great, I’ll send you an email and include some possible times. Just so I propose some reasonable times, is there a day that works better for you? Me: Typically, mornings or afternoons? Me: Great, 3pm Tuesday works for me. I’ll send you a calendar invite as a placeholder. Whammy. Do you see what happened there? Get more email opens by A/B test your subject lines. 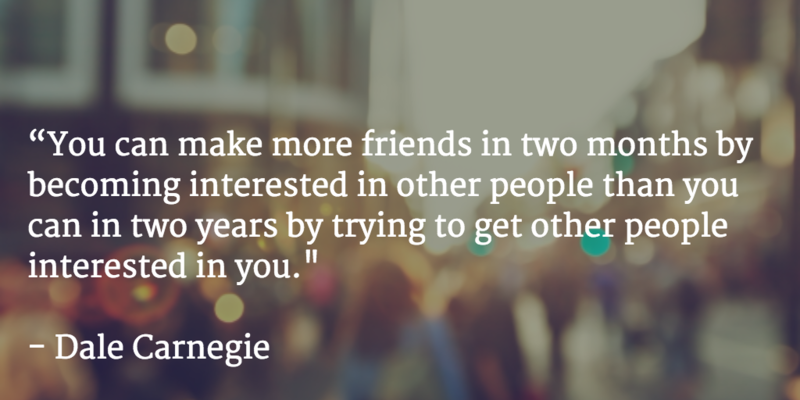 This oft cited quote by Dale Carnegie might be putting it mildly. About 40% of everyday conversation is devoted to telling others what we think. In fact, a recent study by Harvard University neuroscientists found that when people talk about themselves, it gives their brains as much pleasure as money or food. That’s why questions can be so powerful. When you ask someone a question about themselves, there is a strong neurological incentive for them to answer. Real world use case: “Not interested.” The more you understand about why they’re shutting you down, the better equipped you are to disarm their objection. Keep the conversation going by expressing genuine curiosity about their situation and where their interests lie. Yesware Sales Rep David Mejia-Giraldo recently used this strategy to learn more about his prospect (name and company changed) and eventually get to booked meeting. This example is a long one, but trust us — perseverance pays off in the end. Want to book even more meetings? Take our free crash course on sales prospecting.